Wagner Electronics and the CTLGroup have joined forces to develop a revolutionary new concrete moisture detection device. The Rapid RH® is a fast, accurate, relative humidity (RH) probe that significantly decreases the time it takes to measure moisture in concrete floors. The Rapid RH® revolutionizes concrete floor testing by combining a moisture sensor, power supply, and display all in one small device. This rugged, low-cost instrument allows general contractors, inspectors, and flooring professionals to quickly get accurate floor moisture and temperature readings. The Rapid RH® eliminates guesswork, messy testing methods, is disposable and can be left in the testing area. The Rapid RH® fits level with the concrete, preventing damage to the probe. The Rapid RH® is easy to install and fits level with the testing area preventing damage to the probe. 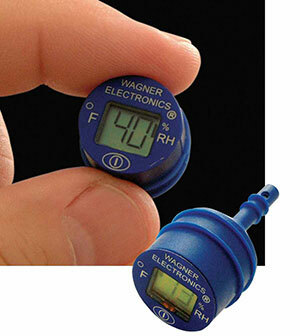 With the push of a button the Rapid RH® liquid crystal display gives you an accurate RH and temperature reading. Drill the hole to the desired depth in the concrete to be tested using a rotary hammer drill and the special countersink drill bit provided in the kit. Remove drilling debris in the hole using the special brush that is provided in the kit and a vacuum cleaner. Insert Rapid RH® probe into the hole and press downward. Allow probe to stabilize and record the RH. Wagner Electronics and the CTLGroup have combined their vast respective knowledge and experience to create a revolutionary new product in the Rapid RH®. 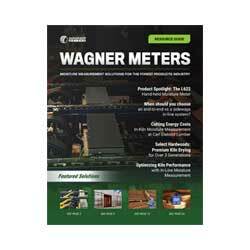 For over 40 years, Wagner Electronics has been recognized as the world leader in providing advanced moisture measurement and management solutions to the forest products industry. Since 1987, CTLGroup has operated as an independent subsidiary of the Portland Cement Association, which was founded in 1916. From its inception as the research laboratories for PCA, CTLGroup is the foremost consulting firm, providing structural and architectural engineering, and testing and material technology services throughout the world. These leaders in moisture management and testing create a credible alliance in the development of a much awaited accurate, time-saving solution to potential flooring failures. It is a partnership built for the future bringing concrete ideas to you today! To order, call 800-634-9961 or visit us at www.rapidrh.com. Reprinted from November|December 2005 Floor Covering Installer Magazine, Copyright 2005 BNP Media, II, L.L.C.